Discussion in 'Downhill & Freeride' started by Full Trucker, Aug 15, 2013. With the passing of the Mountain States Cup (FSM rest it's soul) there's been a certain... void if you will for Downhill racing in Colorado this year. Weird, I know. Sure, there's the Winter Park series and that's cool. And a ProGRT plus Nationals, but that's in Angel Fire. And of course Enduro is the newest, hottest racing phenomenon since forever. But it's just not the same here in Colorado without some of the classic venues to visit, shred and race DH bikes, and get rowdy with your friends. Telluride, Keystone, Snowmass... all gone. 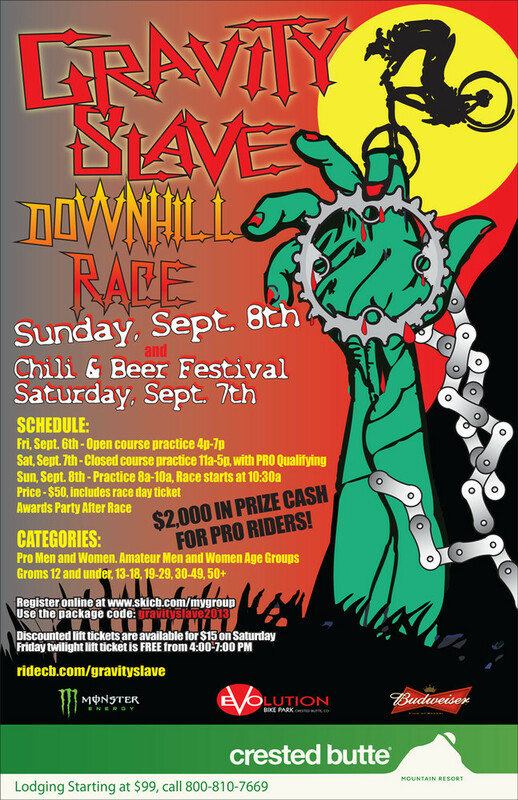 Good thing Evolution Bike Park at Crested Butte is putting it on the line and stepping up with a true Downhill race this fall. Sunday, September 8th, 2013 is race day, with practice days Friday and Saturday. $2000 cash prize purse according to the event poster, a chili & beer festival on Saturday the 7th, and a $50 entry fee which includes race day lift ticket. **NOTE: I've got nothing to do with this event. Sorry that I'm not sorry to spam the board, but if you're upset by someone getting the word out about what could be a fun event&#8212;you need a hobby besides the internet.